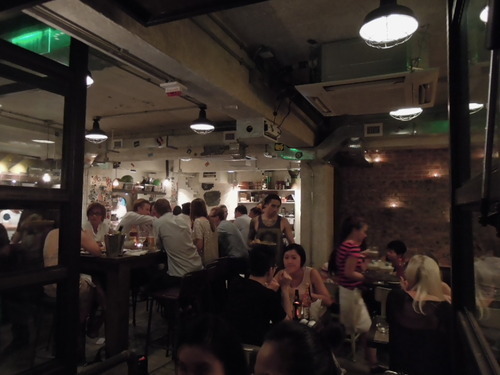 Even though Hong Kong is filled with restaurants of all sorts, there are very few hidden gems; this is understandable, given that we are a very small city with lots of people who love food, and rarely does a good restaurant remain undiscovered. 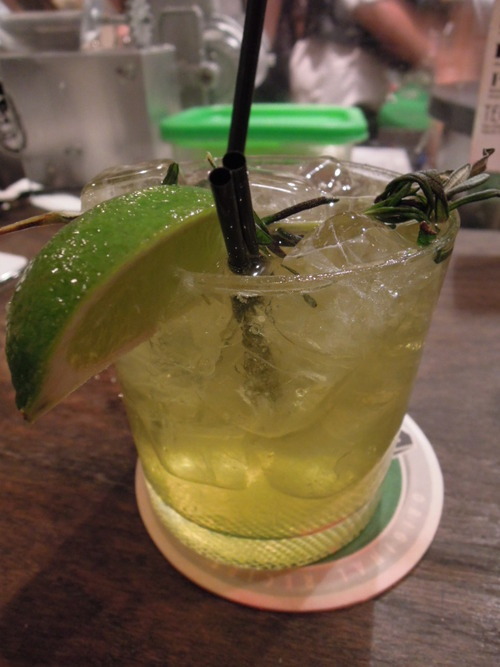 Brickhouse is a Mexican restaurant which tries to stay casual, hip and hidden, but didn’t manage the last aspect so well. Even at its soft opening stage it already became one of the city’s most talked-about Mexican bar and restaurant, with people rushing to try the “best tacos” in town and its range of exotic cocktails. 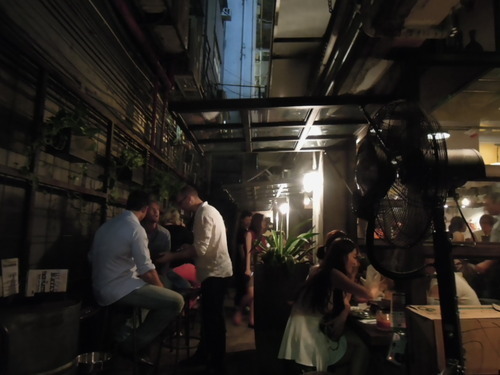 Located on a narrow side alley on Lan Kwai Fong just above Milan Station, you will feel that you have stepped foot in a foreign city as soon as you enter, with its graffiti-adorned walls, exposed ceiling and rustic cement floor. (In fact, for those of you who have been to Melbourne, Brickhouse is very Melbournian with its inconspicuous location in alleyways.) Waiters are reliable, efficient and friendly, and there is no service charge added to the bill so you are free to give whatever you think the waiters deserve! 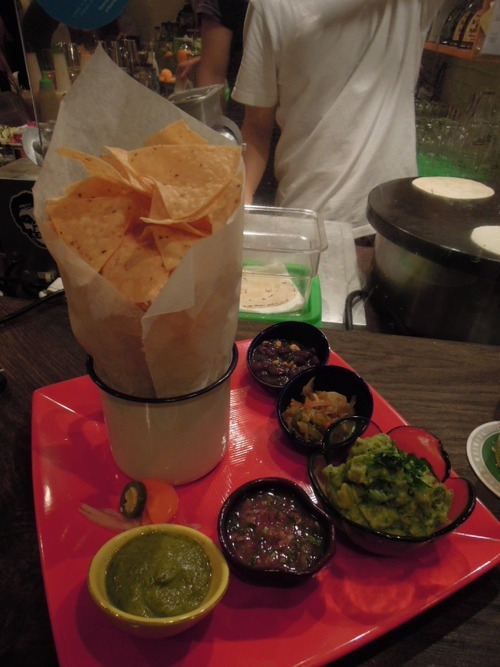 Even at my first visit, I already knew that this would become my new favourite Mexican restaurant in Hong Kong. (2) We also tried Spaceman ($95), made with jack daniels, southern comfort, lime, and cream soda but I thought it tasted a little bit like cough syrup. For something truly exotic, you could try the Cubano ($115), with tobacco-infused tequila, vanilla brandy and grilled pineapple! (3) Moving on to the food, I simply cannot praise Brickhouse’s down-to-earth and excellent Mexican fare enough. Take this Chips and salsas ($125) for one – the chips were organic and stone ground, and had a beautiful taste and a gorgeous crunch. The guacamole was creamy and scrumptious, and the chips were also served with 4 daily salsas and pickled veggies which were absolutely addictive! (4) This Watermelon salad ($75) was another plate of pure joy! 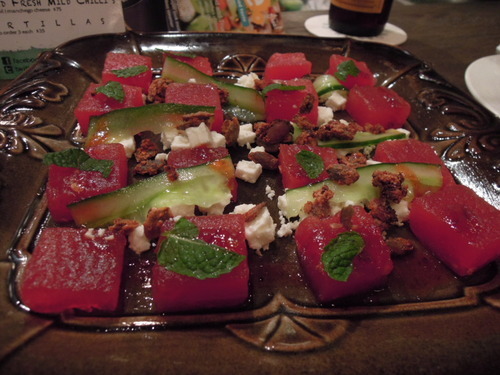 The watermelon cubes were sweet, fresh and juicy, and was a fabulous match with the lemon cucumber, goat feta, chilli syrup, and mint leaves. The secret ingredient which distinguished this salad from the rest was the brown, crunchy candied pepitas, which added a pleasant, sweet touch and was the icing on the cake. 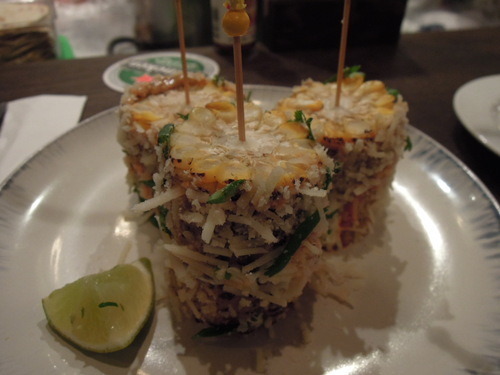 (5) Here is another addiction alert – you will not be able to stop eating this Mexican Style Street Corn ($55), with grilled corn covered in chilli, mayo, lime, and queso, which is really bad as everything else at Brickhouse is so good! The grilling process and the chilli and queso really brought out the sweetness of the corn, and the textures and flavours just came together perfectly. 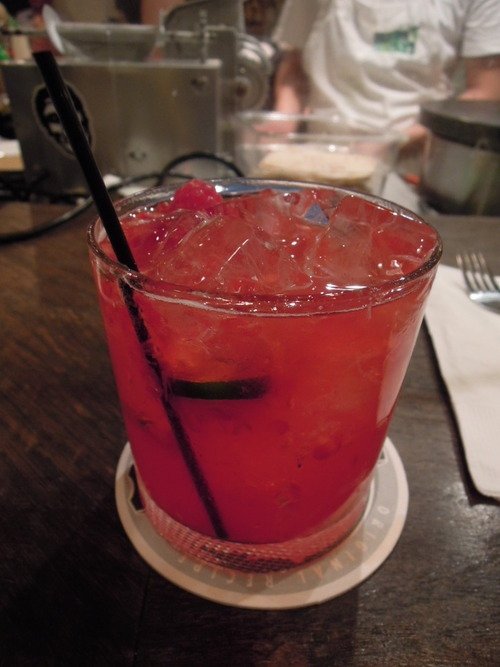 (6) Sometimes at Brickhouse I feel like I am perpetually on a frenzy, and I am not sure whether it is the alcohol, the upbeat music or the heavenly food. 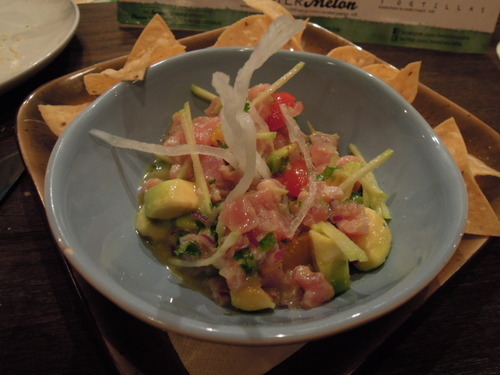 Having been driven crazy by the dishes above, P and I finally calmed down a bit and quietly savoured this Peruvian ($125), which was a yellowtail ceviche mixed with avocado, apple, dicon radish and orange, with a yuzu-lime dressing. The yellowtail was sea fresh and the other ingredients added crisp textures and refreshing flavours to the dish; the yuzu-lime dressing, in particular, was invigorating. 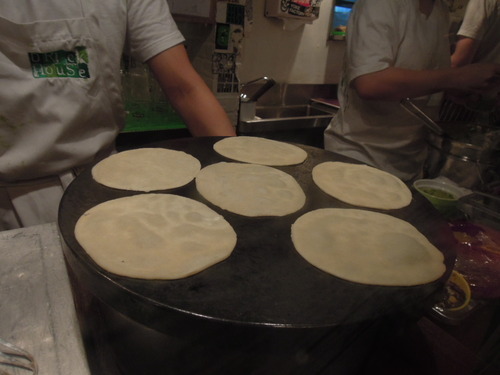 (7) All of Brickhouse’s tortillas are homemade and freshly prepared before you, which explains their smooth texture and clear, natural flavours. It was a mistake for P and I to order a tacos platter ($240) as the two of us had eaten so much already, but we did not regret it and were in fact secretly glad that we did. 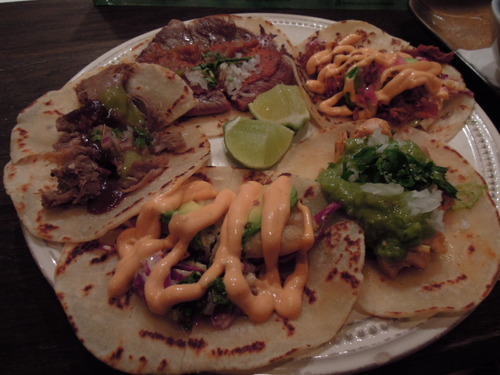 We sampled 5 different tacos – beef tongue, chicken, fish, rib eye and beef. The beef tongue was soft and tender but did not have too much taste; the fish was fried in a deliciously thick batter; the chicken tacos was nicely served with a large dallop of guacamole; the rib eye was juicy and tender, and was served with a thick sauce with a distinctive onion taste; and the beef was grilled until dry and shredded, and smothered in a thousand island-like dressing. Verdict: Absolutely delicious!!! (8) Nutritionists will frown upon people who stuff themselves with colossal amounts of food, but I think that’s the right way to go at Brickhouse! Right after we had finished battling with our tacos platter, our waiter decided to tempt us with a goat’s milk yoghurt ($65) for our dessert, and we succumbed to it. I am a person who prefers cow’s milk to goat’s milk any day, but even then I found this yoghurt dessert incredible – the caramel just blended so nicely with the yoghurt, and the sweetness and creaminess of this dessert was divine. There was also a piece of chocolate bar filled with peanut butter cream on the side. 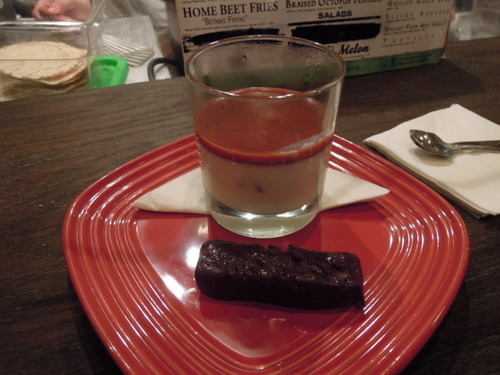 This was definitely a heavy and filling dessert, but aren’t heaviness and strong flavours what Mexican food is about? Conclusion: When the restaurant first opened, the place was heaving every single night and my friends had to wait for 2 hours to get a table. Now the situation seems to have gotten slightly better, but as the place is still popular and doesn’t take reservations, don’t count on being able to get a table especially if you have a large party. If you are desperate for the food like I am, try heading there at 6pm – 6.30pm when the restaurant just opens. Brickhouse serves food until 2am on Monday to Wednesday and until 4am on Thursday to Saturday, so you could also drop by for a post-dinner Mexican treat if you wish!